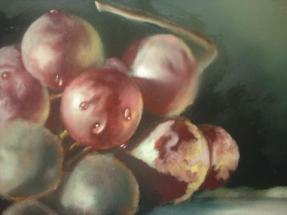 A real art lesson teaching realism that you succeed with! Oil Painting Lessons that can literally change your art life! Yes! You REALLY can paint like this! In a Real Art Lesson, you'll be right there, looking over my shoulder while I create 2 great paintings. 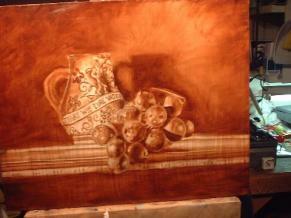 These oil painting lessons are easy to learn. Thousands of people just like you have discovered the secret to unlocking their artistic potential by following the few simple rules given to you in "A Real Art Lesson"
In a Real Art Lesson, you won't believe your own eyes at what you can accomplish. I can't describe on this single page the Joy, and Happiness I feel when producing these works. Sure, there can be problems that come about in any painting, however, those are fixed with good technique, and simple problem solving skills. The happiness is always there. Like in my large florals, and those who purchase them. There is a happiness that goes beyond just saying, "did I really just paint that"! So, lets get down to the nitty gritty of what you're gonna get with this ebook. I'm gonna walk you thru the process of an ancient technique that is rarely taught in academic art schools today. (I can't tell you how many times folks have written to me to state this, those comments are echoed all through out my web site). This technique helps you to learn a fundamental approach that once learned, will help bring you too, the happiness I feel when painting. These fundamentals will also give a great launching point in exploring other techniques to develop your unique artistic style. Keep reading below to get more details. 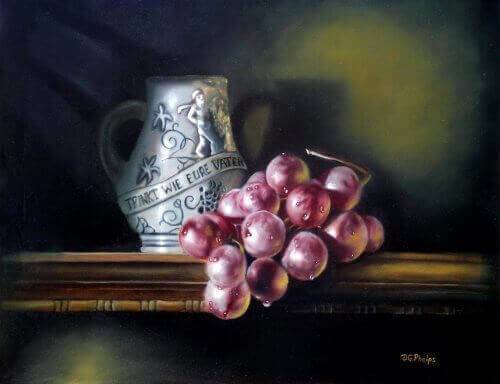 Here are the two paintings I use in teaching "A Real Art Lesson"
The first is "Mit Trinken" a vase with grapes still-life. 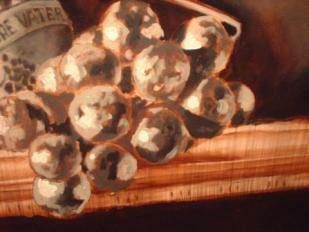 The 2nd demonstration is "Grapes with Pears" still-life. 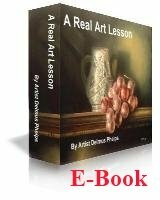 "When I viewed the paintings on the "A Real Art Lesson" ebook cd tears came to my eyes. The work is stunning and truly inspires me to paint again." "Thanks Delmus your e-book is great, I see things I've been doing wrong already." 3rd edition is now available! I'm so excited about this new edition. With this 3rd edition, I've included a linkable Table of content. This makes it soooo easy to move around the eBook by just clicking the Chapter Link. 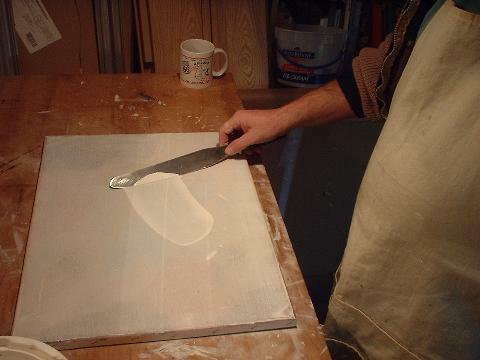 In the appendix, I also include an entire chapter for the beginner on how to manipulate the paint to create hard and soft (out of focus) edges, so important in painting realism. There are 2 example paintings used for this. It's been a long time coming, but the book feels so much fresher for it! I've also included some just released information on the importance of hard and soft edges using my latest painting as an example! You will learn how to place your objects, lighting and composition. 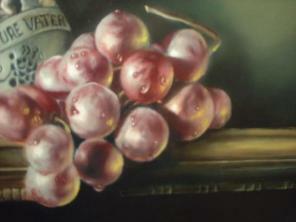 Alot of folks would say, "it's impossible to learn to paint like this without years of instruction." I beg to differ. It's the PROCESS that makes it soooo simple. If you are not satisfied in any way with the instruction, just drop me a line, I have an unconditional money-back guarantee! A beginning artist? I have a whole section on brushwork just for you. How to make soft transitions you see in watercolor work, how to make hard and soft edges, (and why they are important). Give it a try risk free! I know you'll be satisfied with the instruction, and you will learn tools that will give you a Lifetime of artistic freedom and joy! Now, who should NOT order this e-book? If you think your painting will be completed in one 20 minute session, sorry. 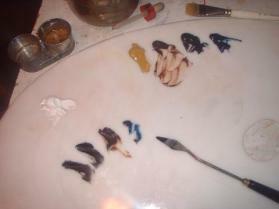 This is not a one session painting technique. Look closely at the work. 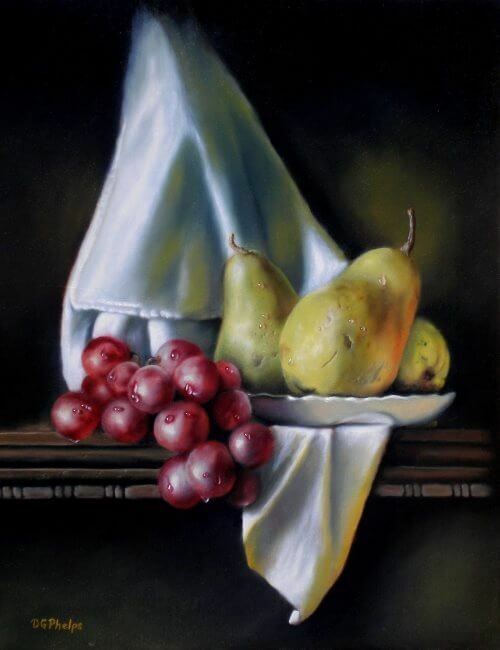 There is a much deeper expression of artistry and detail, nuances within the paintings that cannot be duplicated using a wet in wet or one stroke technique! It is not something that will be done quickly. So if you prefer a one stroke technique, or the wet-in-wet techniques of Bob Ross, this oil painting technique is not that type of painting. If you want to jump straight into portrait painting? The technique is used in portraiture and in landscapes, I do discuss some the preliminary differences, but this course (at least the demonstrations are) primarily geared for the still life. In the schools of yesteryear, the beginning artist started out in the still life, and progressed into portraiture and landscapes. If you are a beginning artist, and want to go straight into these genre's then this course may not be for you. IF you are an intermediate artist, it can be easily adapted to the portrait and the landscape as you will already know some of their fundamentals. All I can say is THANK YOU! I am not a formal artist, but have always loved art and want to learn to paint. You are so clear in your presentations, all my questions that I have never understood, are answered now. You have given me inspiration...I will get started, and am anxious to start another picture using your stages as described in your book. This is the best $MONEY$ I've ever spent! "32 years ago I had just given birth to my 5th child. A month early, she weighed 11 pounds, 14 1/2 ounces, breech. I was so jazzed I walked the halls all night. The nurses kept trying to get me to go lie down but I was supercharged. and oddly, it was not the birthing of a baby, it was the birthing of an idea. The calendar over the nurses station was a photo of Picasso Blue Period, where he drew/painted a lady on a piece of masonite or paper bag. I "saw" that for the first time. I'd already had a semester with Siegfried Hahn, and I knew sharp focus was the way I wanted to work. I also knew the Old Masters way was the vehicle. I could never find the "notes" to back me up. I started back to college when my 9th child started first grade. I was 48 years old. Four years to get my BAFA. And now I have this lesson that will help me do it "my way" finally. I wish I had this ebook lesson back in 2000 to show my professors that I did know there was a process that they refused to teach me. FINALLY! My thanks. " Orders are handled by PayPal, a premier online payment gateway. Not a member? You can still order using their guest features. Most credit cards accepted, and secure. P.S. By placing your order now, I'll include some great bonus offers! 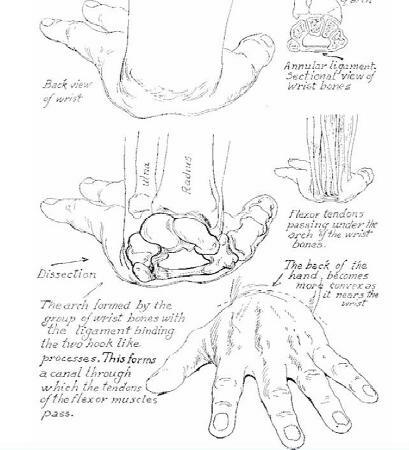 The first is an e-book on DRAWING & ANATOMY By Victor Perard. The hard cover volumn for this book sells for up to $88 on Amazon, but for a limited time, you can get this PDF version downloaded to your computer for free! Let me tell you alittle about this bonus. Are you interested, truly interested in improving your drawing skills, and drawing of the human anatomy? This book is over 165 pages of skeleton, skulls (too cool for the tattoo artist) muscle, human motion, etc. Here's just a small picture from what you will find in it! Impressed? I was, and to find it was a real treat. I thought, wow, what a great bonus gift, so here it is. Included with your purchase. And here is my 2nd fantastic bonus for you! ""Composition was chosen as a title because that word expresses the idea upon which the method here presented is founded the "putting together" of lines, masses and colors to make a harmony.Design, understood in its broad sense, is a better word, but popular usage has restricted it to decoration. Composition, building up of harmony, is the fundamental process in all the fine arts. I hold that art should be approached through composition rather than through imitative drawing. The many different acts and processes combined in a work of art may be attacked and mastered one by one, and thereby a power gained to handle them unconsciously when they must be used together. If a few elements can be united harmoniously, a step has been taken toward further creation."" In other words, your painting and or drawing skills may not be the best, but if the harmony, composition of the piece is done well, the work will be recognized as a great piece of art! I can attest to this in my own work. When the composition wasn't right, the work collected dust in the galleries back closet. Don't let that happen to you! Get this bonus e-book when you order any of my lessons! And here is yet one more great e-book! 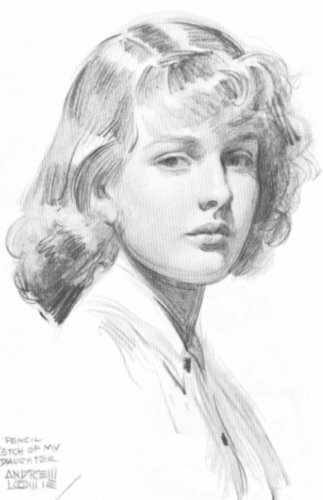 Fun with a Pencil by Andrew Loomie. This e-book has been out there in various places, but is hard to come by. Some of the younger crowd will really get into this one as it shows you in very basic steps on how to draw simple forms, to more complex forms, and finally, some serious fine art! It start you off with the human head, then he moves you through the body, hands, clothing, simulated movement, and into perspective, light and shadow, and ending with this great example! "Best book on the subject I've seen so far - many thanks!" EXCELLENT product...what a great art lesson for the money!!! I show you a great deal information within the "Real Art Lesson", but having a strong background in drawing will always help you in your painting! Grab this free bonus while you can when you order "A Real Art Lesson"! This truly is a RISK FREE! It's pretty simple, if within 60 days, you don't think these instructions have helped you in your quest for a better painting, simply let me know for a prompt refund. So give it a try risk free! This really is a no worries purchase! When ordering, you will be directed to Click Banks secure servers. One of the worlds premier online secure shopping carts! After you place your order, Click Bank will direct you to the download page for the product! It's that simple! Also remember, since Click Bank handles the Credit Card stuff, your order will appear on your statement as a "CLICKBANK*COM" purchase. If you have problems with the download, contact me! I check my email's during the day and will be glad to get you the downloads again. Lets face it, stuff happens, you lose power, your cat jumps up on your keyboard, and coffee floods your laptop. I'll be here to help! So don't wait! You could be painting tonight! 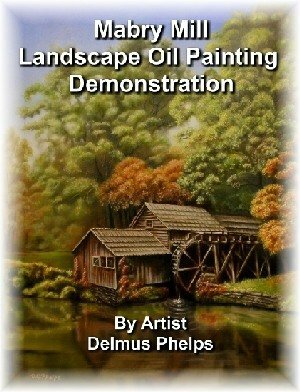 New Landscape Demonstration NOW AVAILABLE! You've heard correctly! Mabry Mill, a famous Virginia landmark is now the subject of a new Landscape Demonstration EBook available through CLICKBANK also. Click on this link here to get all the fine details of what is available within this instructional book. Even more Bonus Material now included! A section for beginners that describes in great detail exactly how to create that "out of focus" look. 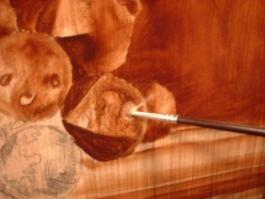 The "soft and hard" edges we painters always refer to in realistic work. The painting below is just a small example used in this new section of the E-book. I've been told this chapter alone is worth the value of the entire e-book! But I think it's just one of those "secrets" that need to be included in this entire process. 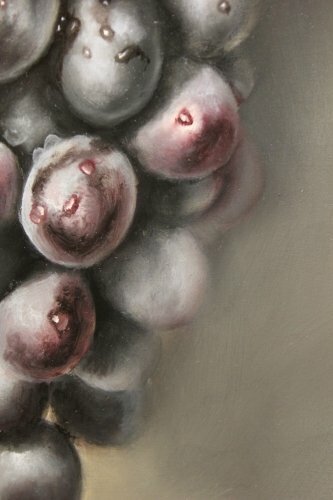 Some really closeup photo's and detail descriptions on how and why these concepts are important in realistic painting. So come on and join us! You'll learn so much! For each of the eBooks, I have included links for you to download, copy, save and later print out the images discussed within each eBook. 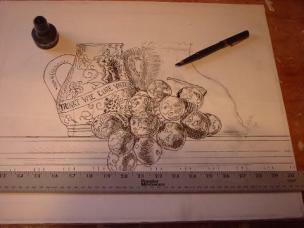 Images available for tracing with eBook or DVD, depending on purchase. These are large images, so you can print them out, trace them, and follow along on the canvas with the lesson. Just check out the confirmation order page for the links! I basically have 2 types of products available. 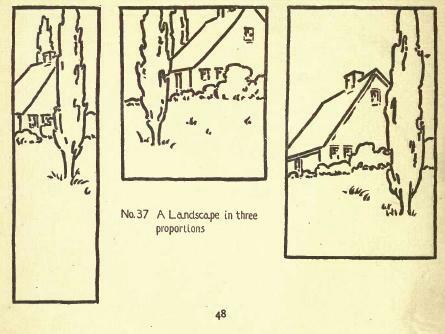 For the still life artist, the landscape artist. Both Ebooks. Real Art Lesson EBook & Mabry Mill EBook combined.